Back at Second Home for another Creative Mornings breakfast. The early start always pays off when you get speakers like Stefanie Posavec and a brilliant bunch of creatives getting together for some 8:30am coffee, porridge and happy Friday chats. 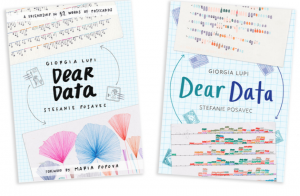 Through a year-long collaboration linking two sides of the Atlantic, Stefanie Posavec and Giorgia Lupi created an award-winning visual conversation that’s now also a wonderful book. (Which we got signed versions of pre-launch – yay! 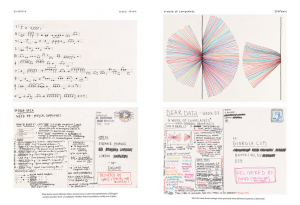 Each week, Stefanie in London and Giorgia in New York, would gather data based on their lives and create visual representations of that week’s chosen theme on a postcard-size piece of paper. Fifty-two themes over fifty-two weeks of unique hand-drawn representations of their daily activities, thoughts and habits. The postcard would then make its way from a New York mailbox to a London postbox and vice-versa, bearing all the marks of its journey across the ocean. On the other side, deciphering the message through a detailed key on the back of the each postcard to help unlock the illustrations, Stefanie and Giorgia would read each others’ weekly adventures. Speaking to us that morning, Stefanie took us through the ups and downs of tracking and documenting your life for a year. From smiling to strangers – which in London means awkward stares and frowning faces – to tracking their grumpiness, noting down their husband’s/boyfriend’s affection and even the amount of swearing they did (and having to pause after each $*%! to note it down), they created what they now see as a ‘personal documentary’ of their lives that year. We left feeling inspired (as usual) and Lucie and her long-distance writer friend Beth have now started her own copycat weekly writing project. You can check out Stefanie and Giorgia’s work here.